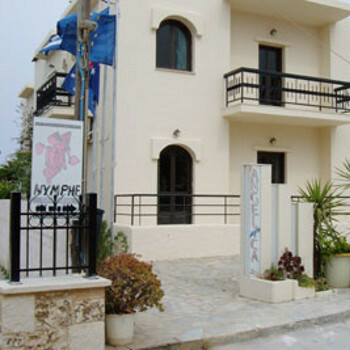 The apartments are just off the main road with easy access to the bus stop for Chania, all local shops and the beach which is across the main road. The owners cannot do enough for you and our apartment, which was part of the main house, had a bath, large living space, massive kitchen and two double bedrooms. a/c was available as was TV and a laundry service for extra cost. There is a small pool which could get a bit hectic at the end of an afternoon which makes opening the windows in one apartment a bit risky but everyone was enjoying themselves so it is not a great hardship. We stayed in a 1 bedroom, ground floor apartment at the back of the building. This was comfortable and spacious with double glazing - no noise at night! Safe deposit box, air conditioning and satellite T.V. were available at extra cost, if required. The apartment, pool and grounds were very clean and well maintained. The accomodation is about 100m off the main road, very convenient for the beach, supermarket, restaurants and bus route to Chania. The Greek/Australian owners, Olga & Stacie, are the most friendly and helpful we have met during many visits to Greece. We stayed here for two weeks in July 2007. The holiday was booked as a late package deal from Olympic Holidays. We had a one-bedroom apartment (No 1). This is situated on the ground floor opposite the swimming pool. It has a small terrace which is shaded from mid morning. The apartment was spacious, simply-furnished and,importantly, had air conditioning. (Satellite TV & air conditioning were extras payable directly to the owners.) Unlike the previous correspondents, we found the double bed very comfortable! The apartment is located about 100 yards from the main road in a quiet side street. The beach is directly across the road about two minutes' walk away. As well as a small swimming pool, guests have access to a pleasant garden area with sunbeds. The owners, Stacie & Olga, both English-speaking, are friendly, helpful and very knowledgable about the area. This is a good base for visiting Chania as the bus stops at the end of the street. The 15-minute ride into Chania cost 1.4 euros. We had a very relaxing holiday here. There are plenty of bars, restaurants and minimarkets in Ayia Marina and even more in the adjacent resort of Platanias. We hired a car during our stay from "Traffic" car rental in Ayia Marina which proved very straightforward - no deposit/credit cards required. We'd stayed near this SC accommodation on previous visits to Aghia Marinas. We knew it was central and close to the lovely beach and because the brochure stated it had undergone total renovation this year, we thought we would give it a try. Big mistake! The 'room with a balcony' we requested on booking was in fact on the ground floor facing the constant flow of pedestrians and traffic and we had no privacy whatsoever. Worse though, which spoiled the holiday for us, were the old, collapsed and non-supportive stained mattresses on all the beds in the apartment. We spent the first few nights alternating them but they were all appalling. We didn't have one good nights sleep whilst we stayed there and an old back complaint re-surfaced and misery ensued. We arrived on Tuesday evening and no-one attempted to clean toilet bins/replace towels until Saturday - the towels and sheets were worn and thin. The swimming pool is tiny. The apartments are 'managed' by a girl we rarely saw. We mentioned the state of the mattresses and were told they would look into replacing them but the owner then avoided us even more and nothing happened. We hired a car and spent a week moving around the island and slept better for it. I've been home four weeks now and my back still hasn't recovered. If you're thinking of booking this one - our advice would be don't bother!